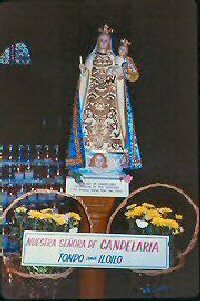 Among the devotions to Mary, veneration to her as the Virgin of Candelaria is popular in many countries including the Philippines, Cuba, Peru, Brazil, Bolivia, Mexico, and the Canary Islands. In each, churches are dedicated in her honor, and statues of her have a unique history of many accounts of spiritual favors granted and miracles worked through Mary for those who petition her in faith. Spanish traditions hold that the image is of that of Mary offering Jesus in the Temple after his birth. This association of her holding the infant and a candle has led her to be called the Virgin of the Candle. When her image visits various towns, the people welcome her with lighted candles. Her presence is then celebrated by processions and festivals in her honor. 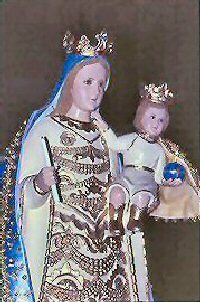 One tradition holds that a small statue of Mary about one foot high was found in the Philippines by a fisherman on the banks of the Iloilo River. Some said that it seemed to grow in size. It is now enshrined in the Jaro Cathedral. In the past, the statue would disappear from the church early in the morning. When this happened, it was reported that a beautiful lady with long flowing hair was seen at the artesian well in the plaza bathing her child. The tradition of Silang, Cavite, recounts how the image of the Virgin of Candelaria was found in the mountains by a man. He kept the image in his hut and prayed to Mary through it. But the image was lost and was not found and was not discovered until the parish priest suggested he would find a place in his church where it could be venerated by all. There is a legend in the Canary Islands which tells that in 1392, before the arrival of the Spanish, a statue of the Virgin Mary was found on the beach of Chimisay by two shepherds. When one tried to throw a stone at it, his arm became paralyzed, and the other who tried to stab at it with a knife, stabbed himself instead. The statue was recognized by others as the Virgin Mary and venerated in a cave. A church was built to house the statue, and still later the Basilica of Our Lady of Candelaira, which was destroyed by fire and again rebuilt. The statue was lost in 1826, when a tidal wave carried it out to sea. But an exact copy had been made which is venerated today in the newly built Basilica.